A successful three-race stint behind the wheel of the No. 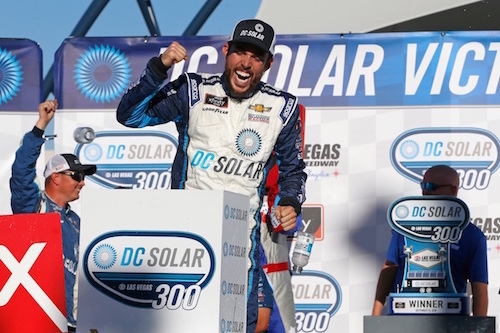 42 Chip Ganassi Racing Chevrolet in the NASCAR Xfinity Series has paid off for Ross Chastain. CGR announced Thursday that Chastain will drive the car full-time in 2019. Chastain has been a NASCAR Xfinity Series regular for four seasons, mostly as driver of the Johnny Davis-owned JD Motorsports. He recently struck a deal with Chip Ganassi Racing, though, to drive the No. 42, a deal for which Davis released him from responsibilities to his team. Those three races with CGR at Darlington (S.C.) Raceway, Las Vegas Motor Speedway and Richmond (Va.) Raceway produced a pole, a win and a second-place finish. The win at LVMS was Chastain’s first-career win. Chastain has made 137-career starts in the Xfinity Series. Including his win and runner-up finish at Richmond, Chastain has four-career top-fives and 15 top-10 finishes. He also has driven for Premium Motorsports in most of the Monster Energy NASCAR Cup Series races this season, posting a best finish of 18th at Texas Motor Speedway.